Looks great! With the lamp update, would it be possible to address the over saturation effect of having a large number of colored lamps close together? If they behaved more like white lamps where they only light up the respective colors of the surrounding terrain to full brightness rather than adding to the color they would look a lot better. Love all this new high-res stuff and it's pretty awesome to see the huge amount of work that goes into every aspect of the game. One thing I do want to draw attention to is how much 'noise' the connectors and wires make on a 'grid' of lamps. Notice how almost 'distorted' the grids seem due to all the wiring and connectors scattered throughout the lamps. Would it be possible to reduce the size of the connector on lamps or shift its position down a little so this is not so prominent? Xeteth wrote: Love all this new high-res stuff and it's pretty awesome to see the huge amount of work that goes into every aspect of the game. maybe that should be a thing to make Displays and large machines wireless... even tho it would require a lot more Signals... maybe the Greece Alphabet + the current Latin one? or custom namable signals? Keep it up, the new universal connector HD art looks delicious! One side note, is there no "read/write" coloured lamp for the belts like you explained for other connected entities? I think I see a red light on the bottom right corner of some of the belt-frame housings, but some have a dark un-lit "bulb" on the top-left corner. The detector light perhaps? Some housing frames don't appear to have the second bulb; could just be me though and the lack of an active preview GIF throwing me off. When do I get what I see here? MrGrim wrote: Looks great! With the lamp update, would it be possible to address the over saturation effect of having a large number of colored lamps close together? If they behaved more like white lamps where they only light up the respective colors of the surrounding terrain to full brightness rather than adding to the color they would look a lot better. Will be nice to have black leds, actually the color black just don´t do nothing, and a new config in the leds to change your brightness, maybe low, with just color on the led, normal and high to brightness even more, and more colors, this will be nice add in Vanilla game, i know there´s a mod for this made by Klonan, but in Vanilla will be even better. One of the belt connector cable seems to have wrong color pairs. Perhaps switch the red and green? That one belt with connector facing to the right. Think we really need an expensive "wireless radio circuit" instead of so many wires all over the place. Stick it on a red/green wire and it can transmit it to any wireless radio circuit in range, rather than having to convert to logistics networks or cable everything in sight. Make a "circuit pylon" that lets you cable red/green from it for a certain range, but also wirelessly "connects" to the next pylon which can be some way away. Would have to be powered to work, obviously! Great FF as always, but I especially love these that show off new super awesome graphics and entities! All the circuit stuff looks fantastic and I think is definitely a change that's been needed for a while. The new lamps also look brilliant! Can't believe it's been 4 years since the first Friday Facts, things have come such a long way! I have to say this looks really great. As much as I like the graphics, it's the fact that wire attachments in lua is being refactored. I just can't get wire interfaces to work in anything I make myself, regardless of how much I try. It doesn't look like it's a coding or lua problem because so far it would appear that I have successfully made whatever I have set my mind on as long as it doesn't contain wires. There are multiple mods to deal with that issue. Just search the mod list for wireless. However they are for long distance signal transfer and not really for what this thread is about, which is lots of wires in a small area. Shadows for vertical wires should bends. Now, the wires looks very tight. Difference - You can tell, if wire is connected to middle inserter, or just pass over it. Last edited by mp0011 on Fri Sep 29, 2017 9:19 pm, edited 4 times in total. Also, those wires don't look HD. Is that going to be a thing sometime? I'd think it would be fairly simple, but I've been known to be wrong in the past . I have a question. Why on the first HD transport belt connector there are no wires inside it? They all have prety wires inside except first. 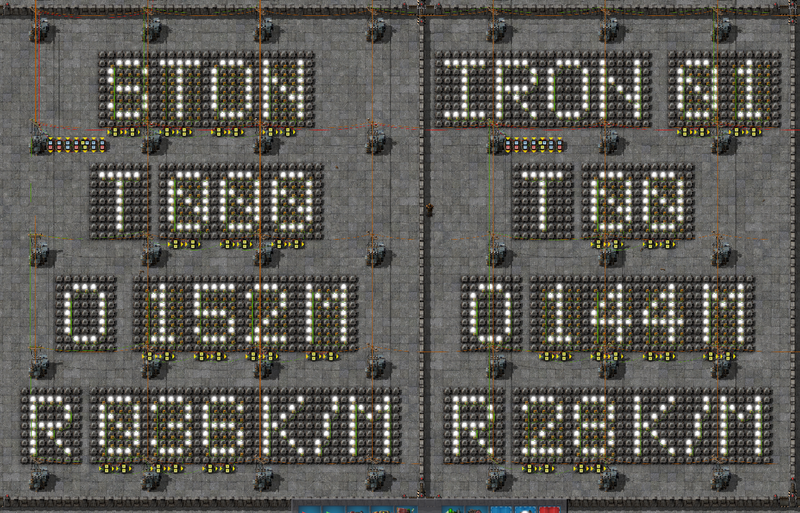 I'd prefer if parallel wires had the same distance for all entities. On the picture inserters have ~5 pixels between the wires while chests have only ~1pixel. This will look weird if you have them in the same row. For example in a chain of chests - inserter - chest. I find the additional red/green wires that are part of the belt-connector make the image too "busy" when trying to distinguish between which wires were manually added and which ones are "just decoration". Using wires as decorations is imho very counter-intuitive design as it reduces the stick-out-factor of the actual wires. Completely removing the inactive lamp on connectors looks weird. I prefer the disabled ("black") lamp from the old design. On above picture the belt-connector's red wire is difficult to see (imho) because it's exactly aligned with the yellow frames border. Same goes for the green wire on the gate. Please, please, please change rail signal write indicator so red light is for a red signal, and a green light is for a green signal, or have a completely new color for when the rail signal is being forced by the circuit network, so as not to conflict with the red/green colors already in use by the rail signals. Also, it would be nice for colorblind users (all users really) if there were an options menu to configure all these circuit network colors, and BLINKING styles instead of just colors. This FFF-post and those pictures fill my heart with joy. Have a nice weekend!